Watch Donna Eden “Energy Medicine” and “The Fuzz Speech” Gil Hedley. Both videos are available on YouTube. Please bring your lunch and a clean empty spray bottle to the class. This is a hands-on training course and each student will work on 4 horses. Students should have general knowledge of how to handle horses before joining the class, and will be required to sign a release form. Students may bring their own horses but expect that other students will work on them. Each student requires four (4) horses for the 3-day workshop, three (3) horses are used over the three (3) days and one (1) fresh horse is used only on the last day. Horses will not be able to work during the days while they participate in the workshop. The required working area includes a well-lighted, flat workspace out of sun, wind and rain such as barn isles or indoor arenas are ideal. Preferably a space where all 8 students can soft-tie their horses and are visible to April. Break room or class room where we go to talk in between hands on work. If the weather is cold, somewhere students can get warm beverage-coffee or tea is ideal. Conformation is what the horse is born with. Posture is what develops from a body in pain unable to move correctly. Basic understanding and applied use of equine acupressure and how the energy meridians affect the whole health and wellness of the horse. How the balance of the hooves affects the organs, thus affecting the whole wellness of the horse as well as the imbalance of the hooves affecting joints and muscles higher up. How to balance the Yin/Yang of the horse. 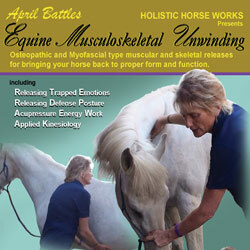 How to do Defense Posture releasing; releasing the muscle pattern developed of Fight or Flight response in the horse. This needs to be done before any muscular/skeletal releases are performed. How to muscle test and use applied kinesiology basics. Level II course goes more in depth of these techniques. 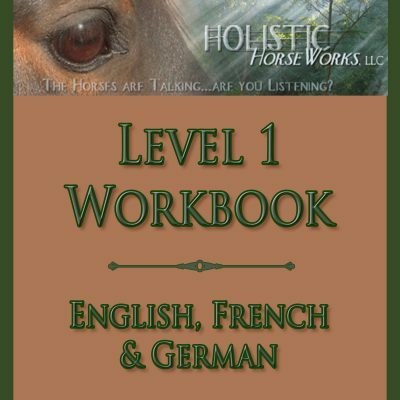 How to feel for energy blocks in the horse’s system and how to release them. As well as how to release 7 cervical neck bones, withers, ribs, hips, elbows, knees, hocks and fetlocks. April then goes through all of the procedures so that you can fine tune your own personal techniques. It comes in a downloadable .pdf format.